We don't cook pretty. This isn't first date food. When you eat a prego, you get steak juice on your chin, butter on your lips, and breadcrumbs down your top. You moan, you groan, you wipe yourself down and come back for more. A Growlers prego is primal. It's about uncensored eating. It's about the pure joy of good food. Back in the day, Portuguese butchers would take leftover beef cuts, bash them with a hammer to make them tender, then cook them in butter and garlic. Stuffed inside a crusty bread roll, it made the perfect snack: delicious, quick, and easy to eat with your hands. That’s the root of the prego. In Portuguese, prego literally means ‘nail’ to remind us what the butchers did to the meat with their mallets. It’s not fancy food, it’s not complicated cooking – a strip of steak nailed to a piece of bread - it’s just exactly what you need when you’re hungry for something full of flavour. Our Truck Archie is a bit of a party animal and he loves doing private events! Need some pregos for your party? Get in touch – we’ll have all your guests eating like animals. Our chilli, Mrs. Burnabums, and variety of seasonal pickles are available for sale. Ask us about wholesale/retail prices. Sustainability isn’t a marketing strategy, it's part of who we are. At every stage of our business, we’re looking for ways to reduce negative impact and create positive value. Our beef is from beautiful Ayrshire in Scotland. The cattle are out on the grass during the summer and in open barns for the winter. The breed is an Angus crossed with a Charolais. Our bread is baked fresh at Madeira Patisserie, a traditional, family run Portuguese Bakery in London. 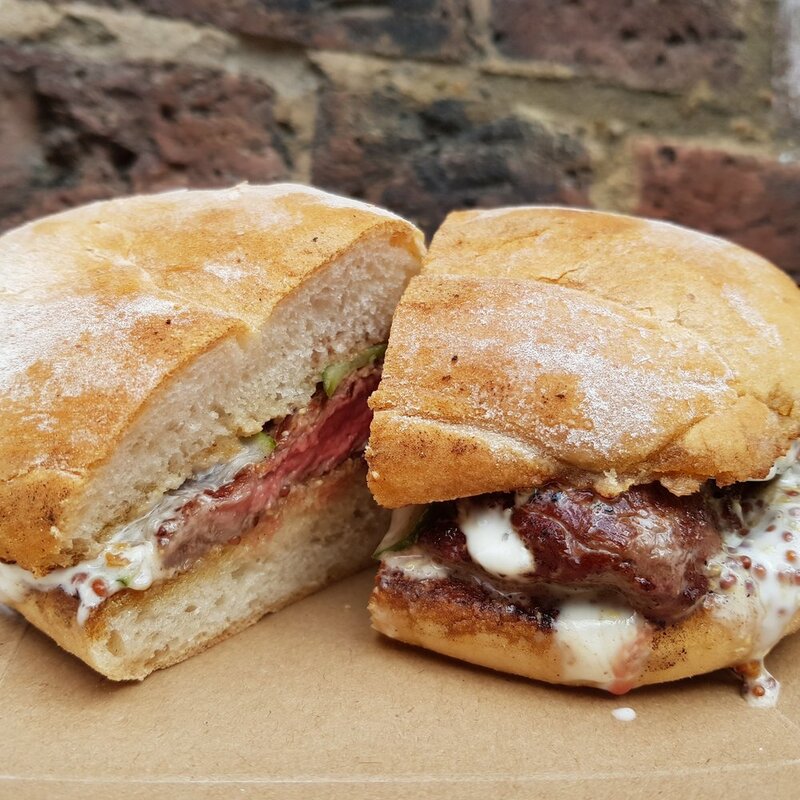 Our papo secos are hand baked to order for us – so if you notice slight differences in the shape and size of rolls from one day to the next, that’s natural. They’re all equally delicious. Our butter is from Netherend Farm in Gloucestershire, where farmers are passionate about the health and welfare of their cows and try to ensure that they have a predominantly grass fed diet from grazing in the pastures during the summer and feeding them silage in the winter months. We serve a range of soft drinks from Karma Cola - a foundation that sources organic and fairtrade products from communities in Sierra Leone, Paraguay, Sri Lanka and Papua New Guinea. Our Water is Thirsty Planet British spring water, which ensures a donation to Pump Aid with every bottle sold. We use ORA napkins, which are made from recycled materials and are 100% compostable. All of our take away boxes are from Biopac and are 100% compostable. We do not serve single-use plastic. We do our best to separate our recyclable waste while we work. Plastic packaging and paper gets discarded separately from food items. Oil gets collected and sustainably disposed every six weeks. Growlers is currently developing a new social initiative for 2018. Details coming soon. De Pato is a Growlers’ sister brand, offering a contemporary street food rendition of portuguese duck rice. De Pato is a one dish concept. Rice, sautéed in duck fat and cooked slowly in duck broth, served with a generous portion of shredded duck, duck jus and smoky chorizo. This abundance of duck is the essence of one of Portugal's most emblematic and traditional dishes - the arroz de pato. De Pato is present in select markets accross London and available for private hire. Please click here to get in touch. Sign up to receive monthly updates of where we are!